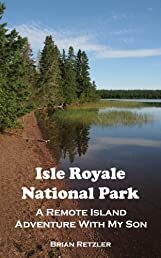 Isle Royale National Park is Michigan's only National Park. The island is roughly 45 miles long and nine miles wide and is located about 50 miles north of the Keweenaw Peninsula. The island contains approximately 165 miles of trails and is home to various flora and fauna. The island's moose and wolves have been the subjects of the longest continuous predator-prey study in the world. Isle Royale's pristine wilderness is a magnet for hikers from all around the world. The trails range from easy-going, rather level terrain, to constant ups and downs over rugged, exposed rock faces. This book details a hike taken in 2011 on what is commonly referred to as the Feldtmann Loop on the western side of the island.